RETIRE IN STYLE BLOG: How Important is Your Past? A reunion with my classmate family! How Important is Your Past? A reunion with my classmate family! 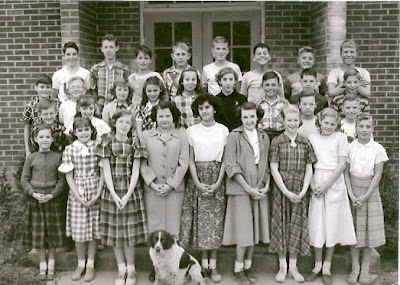 and, of course, Jo (front row 3rd from l.) and her dog in the very front! When the class of 1959 from Huntington High School gathered for a group picture, it only seems reasonable that someone would say "Take the picture in black and white like the ones in our annual used to be." I had just bought a new camera and could have taken the picture in any mode they wanted. Black and white was their choice. Isn't it funny how we can slip easily into a time that is long past? A black and white picture or a phrase will take you to places you had long forgotten. Smells and sights come back without any warning. This was an experience new to me...I had left my high school world and never looked back. When my classmates gathered after 53 years for a reunion and a beautiful journey down memory lane, I felt sad that so many years has passed without ever seeing them. There were 17 in our class in 1959 and 8 were able to come for the day in 2012. Why was this so important to me after 53 years? Could it be that I needed some closure for my childhood years in order to actually become a fully developed adult? Did I need to see that the others have grown up and grown old just like I have? I did not realize the importance of hugging these people that were like my brothers and sisters. They do feel like my siblings. tease each other without any fears! When my classmates told me about their children and what their life looks like now, I was comforted to know that we were not all that much different. In the end, we could sit together for hours and never experience an awkward silence. Then there was the laughter...the person that had always lifted us up could still do it for us now. There was a genuine feeling of affection and love that we had for each other. It was hard to say good bye. Note: The two people that made this happen, Gary and Lee, gave us all a gift of renewed friendship with people we had lost. I am grateful to them and always will be. My classmate friends...you still make me feel like a young girl. Thank you for that. I hope you feel as lucky as I do! Be well and remember my love until we meet again.